The differences between the original and the version 2.0 are upgraded coils from ceramic donut style to dual quartz, a metal mouthpiece instead of glass and the introduction of the glass water bubbler. Overall, this is a sturdy and portable vaporizer kit for wax concentrates with great upgrades. The XVAPE Vaporizer V-ONE 2.0 is a 1500mAh, portable wax vaporizer with two mouthpieces and two temperature settings. The kit comes with the V-ONE 2.0 battery and stainless steel mouthpiece, user manual, a micro USB charging cable, a spare 0.5ohm dual quartz coil, replacement rings and a battery stand. The kit also includes a micro glass bubbler kit which includes the glass bubbler mouthpiece and a magnetic dab tool with carb cap. 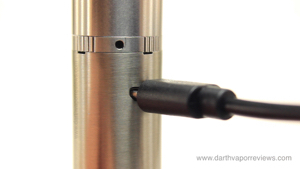 The stainless steel mouthpiece coupled with the V-ONE 2.0 battery is roughly 4 1⁄4" in height. To charge the V-ONE, plug the USB cable into a wall charger and insert the micro USB into the charging port on the side of the V-ONE. Allow six hours for the initial charge. The Red LED light will turn off when fully charged. 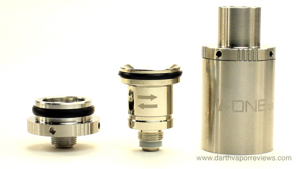 The top contains the stainless steel mouthpiece, heating coil and the base. The kit comes with two 0.5ohm dual quartz coils. To replace a coil, unscrew the old one from the base and screw in a new one. Load concentrate directly on the coils with the included dab tool and replace the mouthpiece. Click the power button five times to turn it on or off. The V-ONE has an automatic 10 second cut-off to protect from over heating. Press the button three times to switch between temperature settings. Red for low and Green for high. To use the water bubbler, fill with a few drops of water from the top. 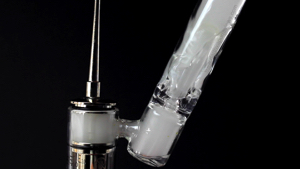 Replace the stainless steel mouthpiece with the glass bubbler. 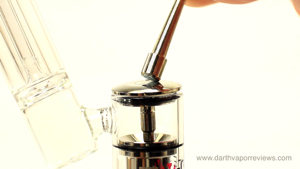 the dab tool becomes a handle for the carb cap. 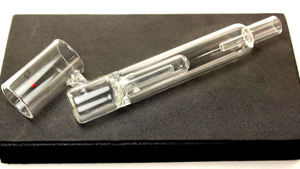 The glass water bubbler coupled with the V-ONE 2.0 battery is roughly 7 1⁄4" in height by 3" wide. The V-ONE 2.0 is a very durable device. The dual quartz coils really put out some heat and do warm up the battery a little when fired several times in a row. 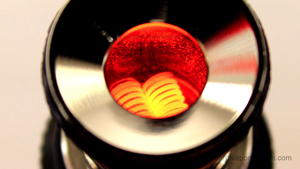 The glass can also get hot at the base during the process. The glass water bubbler and magnetic dab tool with carb cap are really cool accessories and make the kit in my opinion. The stainless steel cap setup is great for on the go and the glass bubbler is great for the house. I'm glad XVAPE included the battery stand because it's very unstable with out when using the water bubbler. * Battery and glass get hot after several uses.